Threaded inserts can be categorised are being blind or thru, although blind inserts are sometimes called closed and thru inserts as open or sighted. 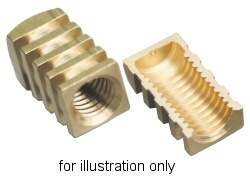 Blind threaded inserts are used in many applications where the the closed end is a feature of the finished product or assists in the moulding process . Here are some of the blind threaded inserts that we have in stock. If we do not have the blind threaded insert that you need, please contact us so that we can manufacture it for you.